The recently completed Chevron Science Center Annex offers a bright, modern, and Gold LEED-certified research space for undergraduate, graduate, and postdoctoral chemistry students. Pitt Distinguished University Professor of Chemistry Peter Wipf assisted with the design of the lab­— which was built with the help of state funding—keeping in mind the work of his collaborative research team. Among the priorities for the project was the creation of a functional environment for the safe coexistence of researchers and thousands of chemical reagents. In the new space, these materials are housed in separate rooms entirely—away from the student work areas. Large windows on a slanted wall replaced bricks and mortar, providing a bright, transparent workspace. 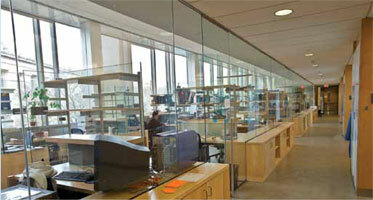 Glass walls and doors allow researchers to see most of their laboratory and study space from their desks and benches. A lounge, kitchen, and conference areas provide students and staff with other opportunities to study, have discussions, and exchange ideas. Pitt Chancellor Mark A. Nordenberg, right, makes a point during a Pittsburgh Technology Council breakfast briefing held Dec. 6 in the Rivers Club, Downtown. Nordenberg and Jared Cohon, left, president of Carnegie Mellon University, discussed their schools’ cooperative relationship as well as the importance of Pennsylvania maintaining its funding levels for higher education. Nordenberg said that continued access to education for all is essential to the region and the nation. 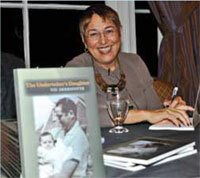 Pitt professor of English Toi Derricotte, a nationally acclaimed poet, launched her newest book, The Undertaker’s Daughter (University of Pittsburgh Press, 2011), during a Dec. 7 book signing and reading in Pitt’s University Club. Derricotte has authored four other books of poetry and has had more than a thousand of her poems published in anthologies, journals, and magazines. She is the cofounder of the Cave Canem Foundation, an organization that has been offering workshops and retreats for African American poets since 1996. The Iota Phi Foundation, an affiliate of the Pittsburgh-based Iota Phi Chapter of Omega Psi Phi Fraternity, honored three Pitt alumni with the service fraternity’s annual Exemplary Service Awards during a Nov. 19 awards ceremony at the Syria Shrine in Cheswick. Honored in the business, medicine, and education categories, respectively, were: Curtis Aiken (’87 CGS), left, president, CEO, and founder of Pro Tech Compliance Inc.; Margaret Larkins-Pettigrew (NURS ’76, MED ’94, GSPIA ‘10), an assistant professor and program director for global health and reproductive science at Case Western Reserve University and a former program director in Pitt’s School of Medicine; and Aaron R. Mann (‘71G, ‘81G SOC WK), a professor in Pitt’s School of Social Work. The Iota Phi Foundation is operated by professional African American men who volunteer to improve the quality of life of people in the greater Pittsburgh community. Jinx Walton, director of Pitt’s Computing Services and System Development, was the keynote speaker during the Pitt Staff Association Council (SAC) Fall Assembly Nov. 15 in the William Pitt Union. The Assembly’s title was “Effectively Using Technology in Your Job.” Chancellor Mark A. Nordenberg (right) welcomed participants, and SAC President Deborah L. Walker (below left), who also is Pitt’s student conduct officer, delivered opening remarks. 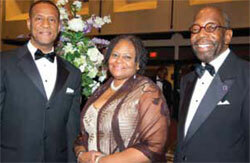 Larry E. Davis (below right), dean of the School of Social Work, Donald M. Henderson Professor, and director of the Center on Race and Social Problems at Pitt, received the Community Leadership Award during the Ronald H. Brown Leadership Gala hosted by the Urban League of Greater Pittsburgh. The Dec. 2 event was held in the Westin Convention Center Hotel, Downtown. 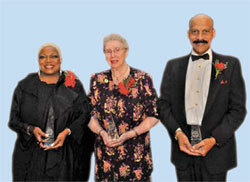 Also honored that evening were Bev Smith (below left), the only nationally syndicated Black female talk show host until Pittsburgh-based American Urban Radio Networks cancelled her show in October, and Sister Marie Immaculee, who accepted the Special Lifetime Achievement Award on behalf of the Pittsburgh Sisters of Mercy. The Ronald H. Brown awards are presented annually to individuals or organizations that display superior leadership in improving the quality of life of African Americans. 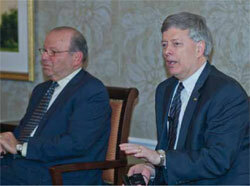 Event cochairs were Pitt alumni Greg Spencer (CGS ’80) and Alan Trivilino (KGSB ’88).